Bonefishing in the Turks can be an expensive proposition, as gas is over $6/gallon and living expenses are high ! For anglers who are experienced fishing the flats and have already developed an eye for spotting bonefish, we are pleased to offer some low cost options to get out in search of fish on the flats of the Turks and Caicos. We are a distributor for Legacy Paddlesports – recognised as a leader in the development of fishing kayaks and paddleboards, and so have a range of their products available for rent. The fishing kayaks are equipped with safety equipment, fly-rod holders, performance seating and a fast-anchor system. They have been designed specifically for fishing in skinny water in the most stealthy way possible ! LiquidLogic Deuce-Coupe : This is the most versatile tandem sit on top ever produced and the only tandem sit-on-top kayak with a deployable skeg for tracking. With the skeg tucked away, the Deuce Coupe steers effortlessly from the stern and solo seating positions while paddling rivers and back bays, but with the skeg in the down position, the Deuce Coupe tracks straight and true. This versatile sit-on-top is especially family friendly with three seats and plenty of space for additional gear. 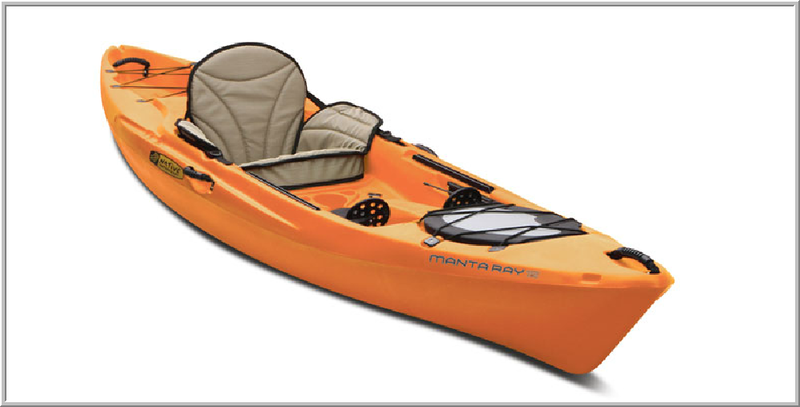 Manta Ray Sit onTop Kayaks : Available in 11ft and 14ft versions, these kayaks have performance seats, integrated fly-rod holders, coolers strapped to the stern well and plenty of storage space for all of your fishing gear. The trade-ff (there is always a trade off!) between the two different lengths are speed in the water when paddling Vs stopping time and nimbleness in the turn. 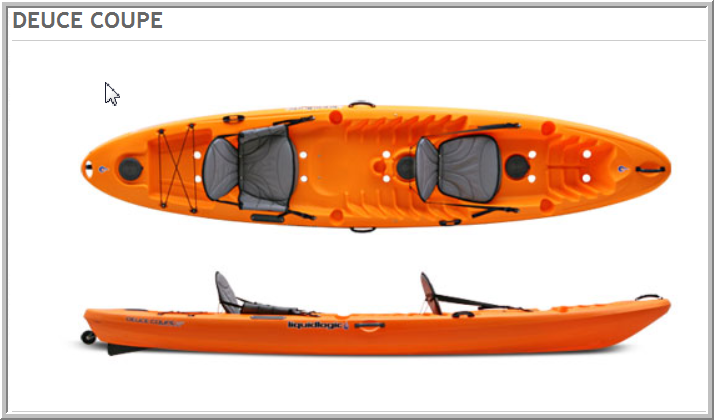 Both fishing kayaks are capable of supporting anglers up to 250lbs both sitting and standing. The 11 is ideal for anglers who like to vary their routine between moving and staking the boat for wading. When paddling across the flats, the 11 changes direction quickly, and if you take on a little splash, the water runs right through the meshed DVC Seating (Drains, Vents Cushions), the gold standard in sit-on-top seats. Other comfort features include Easy Foot rests and padded carry handles that pamper your fingers and toes, and a Tag Along Wheel. Secure dry bags and fishing crates in the recessed cargo area aft; dry storage up front. The Manta Ray 14 is a faster paddling kayak and sligvhtly heavier than the 11. It obviously also has more stowage space, with lots of dry storage up front, and a generous, recessed deck in the back, plus two day hatches within easy reach. Deluxe DVC (Drains, Vents, Cushions) is the best sit-on-top seat, drier and cushier than anything you’ve tried before! Stand Up Paddleboard : The latest in stealthy fishing technology!! 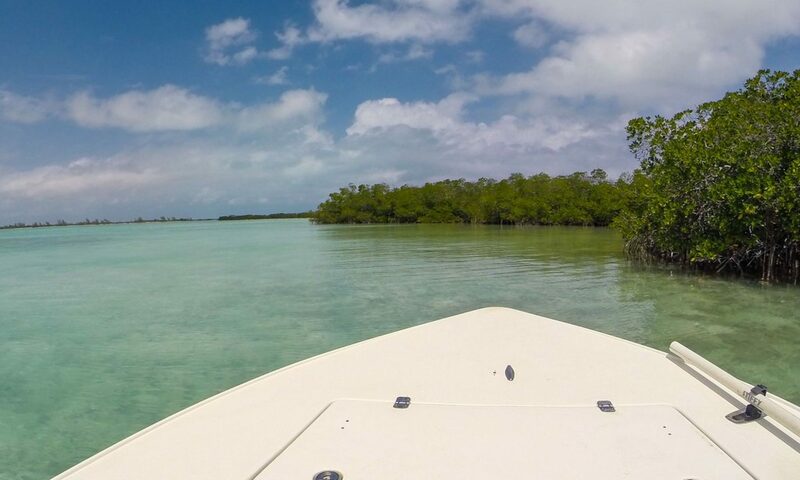 Ideal for fishing the flats of the Turks and Caicos, we are pleased to be the first in the Islands to offer Stand-up-Fishing on proven, industry leading VersaBoards by Native Watercraft. These boards offer all of the safety, convenience and performance of fishing kayaks, but offer significantly more beam and buoyancy to allow the angler to comfortably stand and cast from a stable platform. Over 12ft in length and almost 3ft in beam, there is sufficient volume and beam to give you confidence when you stand even when the wind is blowing !! The boards are equipped with flushmount rod-holders as well as a Scotty fly-rod holder, and a comfortable seat for paddling. When bonefishing in the Bottle Creek area, this combination allows you to cover ground quickly, and when fish are found “switch” to paddle-board mode and stand-up casting to fish. The Versaboard has a shallow draft that alsop enables you to follow the fish up into the mangroves and sightcast throughout the tide.